The past 10 days have witnessed a significant escalation of violence all along the line of contact (LOC) between the Ukrainian armed forces (UAF) and combined Russian-separatist forces in eastern Ukraine. What follows are four initial observations about the increased fighting and then my take on what accounts for it. No significant change in the LOC since February. As of yet, there have been no significant changes to the LOC since Minsk II was signed in February. The OSCE managed to negotiate a withdrawal of forces from Shyrokyne, a village to the east of the port city of Mariupol, last month, and it briefly succeeded in arranging a ceasefire between local commanders there as well. The ceasefire has broken down over the past several days, and several civilians were killed by separatist fire in the nearby village of Sartana, but to my knowledge neither side has reentered Shyrokyne or otherwise taken additional territory. There have probably been minor changes elsewhere along the LOC, but the important point is that so far they have been minor. 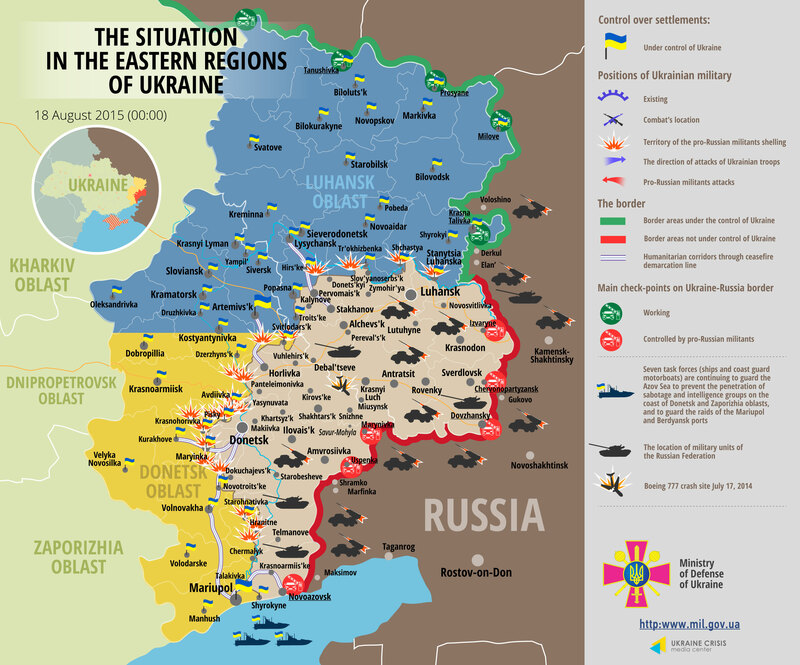 Most of the fighting is still in the Donetsk/Horlivka suburbs. While fighting has ramped up along much of the LOC (see Map 1 above), most of the violence continues to be concentrated to the west and north of Donetsk and Horlivka (see Map 2 below). No evidence of major offensive near Hranitne by either side. Early last week, Kyiv claimed that a large separatist/Russian force had attacked the government-held village of Starohnativka (prewar population around 2,000), which is located roughly half way between Donetsk and Mariupol (see Map 3). The UAF spokesman claimed that Ukrainian forces had not only repelled the attack but had advanced to take the village of Novolaspa (prewar population around 400). A day or two later Kyiv admitted, however, that the separatists were still in control of the village. A Vice News reporter visited the area on Wednesday and was told that while there had indeed been a battle earlier in the week, no territory had been taken by either side. Nor was it clear which side had started the fighting. The Starohnativka/Novolaspa region is a very lightly populated rural area to the northwest of Hranitne (prewar population around 1500). Under normal conditions, Hranitne is about an hour’s drive from Mariupol (to its south) and Donetsk (to its north). The area is therefore rather out of the way and is not regularly patrolled by OSCE monitors (which may be why one or either side decided to ratchet up the fighting there). Both sides appear to be exaggerating the extent of mobilization by the other. The UAF has argued that there are now some 9,000 Russian regular troops and 33,000 separatist irregulars in eastern Ukraine, and that these combined forces are equipped with some 400 main battle tanks, 2,000 armored personnel carriers, and a great deal of artillery and MLRS systems. They also claim that there are now some 50,000 Russian regulars in Russia near the Ukrainian border, and that an open attack by Russia on Ukrainian forces is likely. Unsurprisingly, the separatists and much of Russian media claim the opposite, that the UAF is massing forces and preparing to launch a large offensive. I have not, however, seen nearly as much evidence of major troop concentrations by either side as I did before the introduction of Russian regulars last summer or before the Debaltseve battle. Nor has NATO or other Western intelligence sources confirmed Kyiv’s claims about the number of Russian regulars on Ukrainian territory, the number of tanks in the DPR/LPR, or the scale of Russia’s buildup near the border. While I am by no means sure of this, the impression is that Western intelligence services have concluded that most, if not all, Russian regular military units withdrew from Ukrainian territory after Debaltseve, and that the Russian regulars still in eastern Ukraine are fighting alongside irregulars or are serving as advisors, trainers, technicians, and perhaps intelligence officers. It is of course possible that one or both sides have succeeded in concealing major troop movements in the conflict zone, but I doubt that is really possible given how many local civilians have digital cameras and internet access – stuff shows up on the Internet, as was the case in the lead up to the Russian surge last summer and again during the assault on Debaltseve. Accordingly, my guess is that both sides are exaggerating the extent of military mobilization by their adversaries. So what to make of all this? It strikes me that there are at least four possibilities. The separatists are deliberately ratcheting up the fighting without orders from Moscow. The separatists are of course dependent on Moscow for support, but in the absence of a unified chain of command, individual commanders operate relatively independently and doubtless sometimes against Moscow’s wishes. Regardless, I think there is almost no chance that the separatists can take a significant population center like Mariupol, Kramatorsk, or Slavyansk without large scale and open Russian military support. Nor is it clear why they would make an effort to take a small village in the middle of nowhere like Starohnativka. They do, however, have a considerable interest in pushing the UAF back from the outskirts of Donetsk and Horlivka, which UAF forces have been shelling pretty regularly (they say in response to artillery and MLRS attacks by the separatists). If the surge in violence is indeed the result of a deliberate policy to launch some kind of offensive by the separatists, I would expect the main target of the effort to be Pisky, other suburbs to the west and north of Donetsk and Horlivka, and perhaps Avdiivka. Other pressure points would be diversions. That said, I think the separatists would be very hard pressed to make much progress against UAF forces near Donetsk and Horlivka, given how much trouble they had driving the UAF out of the Donetsk airport. 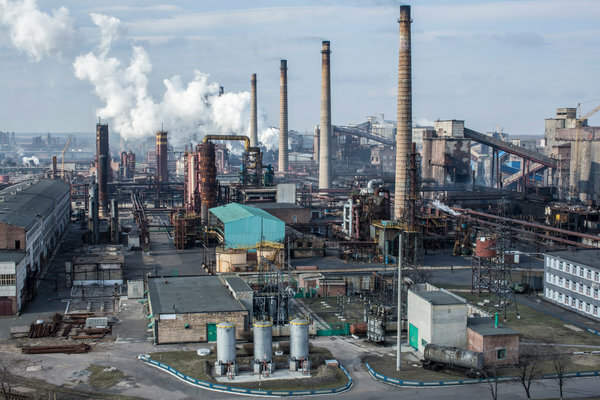 In particular, I doubt they could take Avdiivka, with its large and easily defended coking plant. Moscow is deliberately ratcheting up the fighting. If so, I doubt that the result will be an offensive directed at taking significant additional territory that includes a major urban area. To put the argument I’ve made in earlier posts briefly, I assume that Moscow realizes that taking additional territory will only make Russia’s strategic problems worse, not better, particularly its NATO problem. So I don’t think it will happen. What we will see instead is more of what we have had to date – shelling, MLRS attacks, occasional probing by separatist/Russian ground forces of the LOC, but not a significant change in the LOC. The objective would be to maintain pressure on Kyiv, both directly in the form of military pressure (and the economic and political pressure that comes with it) and indirectly in the form of political pressure from Western governments interested in de-escalating tensions. Moscow has been pressing for a new round of “Normandy format” talks (Russia, Ukraine, France, and Germany), and it doubtless still hopes that it can get the Germans and French to pressure Kyiv into some form of “federalization” that gives the DPR and LPR an effective veto over Ukraine’s external alliances and orientation. That said, I should add that there is a more worrisome possibility, which is that Moscow has, or will at some point, decide that the only way it can scare Western governments enough to apply real pressure on Kyiv is to openly attack Ukrainian military assets, including command and control facilities and weapons systems well behind the frontlines (what I called the “shock and awe” option in earlier posts). That, I think, would be a very serious mistake by the Kremlin, because the probable result would not be a change in Kyiv’s position on “federalization” but a great deal more Western military assistance to Ukraine, including lethal equipment, more sanctions, even worse pressure on the Russian economy, and potentially a long and debilitating war with Ukraine. I doubt the Kremlin is so reckless as to take that course, but it might be. These four possibilities are not exclusive; indeed all four are probably at work to one degree or another. Given the nature of the fighting (along much of the LOC, using mostly artillery and MLRS fire, and no obvious effort to take significant additional territory), however, my take is that the relatively benign version of Possibility 2 is the most likely explanation. That is, Moscow has decided that it wants to apply renewed pressure on Kyiv and the West, but it doesn’t want to go so far as to provoke more sanctions, more Western military and economic support for Ukraine, more NATO troops moving east, or a major Russia-Ukraine war, let alone a NATO-Russia war. The problem for the Kremlin, however, is that increased military pressure of this nature is unlikely to work. It is possible that it may induce greater efforts by France and Germany to make an effort to negotiate yet another ceasefire, but I doubt it. My sense is that that horse has left the barn and that Merkel in particular does not want to waste more political capital trying to get the parties to the conflict to reach a political settlement that is not going to happen, particularly given that she has to manage the ongoing Greece/Euro crisis. More intense fighting will, however, increase Ukraine’s economic problems, and probably its internal governance problems as well (although a big surge in violence might have the opposite effect of once again unifying the Ukrainian people and rallying support for Poroshenko and the government). Moscow has to be gambling that it can keep up the pressure and induce pain long enough to produce a backlash against the current government’s pro-Western orientation, and that Ukraine will cave in before the Russian economy implodes and popular opposition to the conflict grows in Russia. I doubt that will happen, but if it does, it will take a very long time – given current popular attitudes towards Russia in Ukraine, the government is not going to change course soon. And timing going forward is important here. The Russian economy is already in serious trouble, and while the consensus forecast is a return to growth by next year, my sense is that the downside risks are high. But in any case Russian military spending cannot continue at its current rate for very long. Accordingly, Putin may well conclude at some point that Russia has been backed into a corner and that he needs to do something dramatic in response. One option would be to try to do to Ukraine what NATO did to Serbia in 1999, which is to bomb it into submission. Or he might make some dramatic move elsewhere, like provoke a crisis with NATO in the eastern Baltic that falls short of war but scares the pants off Westerners. And there is also a risk that, given the current atmosphere, some kind of accident – an aviation disaster or a Kursk-style submarine incident (see, for example, the article by Alexander Goltz here) – spirals out of control. I don’t think it will come to that, but I repeat what I have been arguing since I started this blog last year – a low probability event with catastrophic consequences is worth worrying about. Best not to sleepwalk into disaster.